We report a computational study of two series of molecules, one having the Si–O–N linkage and the other with the Si–(CH2)n–N linkage, where n = 1–4. The silicons have various substituents—combinations of H, CH3, F, Cl and CF3. Many of these compounds have been prepared and characterized experimentally. The Si···N distances were found to be relatively short, which may denote a noncovalent interaction or may simply be dictated by the molecular structures. This and the nature of the interaction (if any) were the subjects of our study. 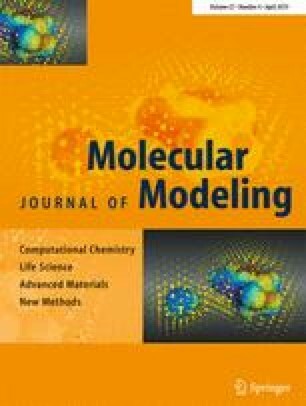 We addressed these issues computationally, determining optimized geometries, energies and electrostatic potentials at the density functional M06-2X/6–31 + G(d,p) level. We conclude that there is an attractive Coulombic Si···N interaction in each case, although it is sometimes quite weak. It involves the lone pair of the nitrogen and the positive σ-hole potential produced on the silicon by the bonding from the substituent that is anti to the nitrogen. This accounts for the key features of these molecules, such as the dependence of the Si···N distances upon the electron-withdrawing power of the anti substituent and the effects of gauche chlorines in weakening the interactions. When the Si···N interactions are disrupted by rotation of the N(CH3)2 group or by conversion of the molecules to open-chain conformers, the Si···N distances lengthen and are essentially the same regardless of the substituent in the anti position. These observations confirm the presence of Si···N interactions in the original molecules. We are pleased to join in honoring Tim Clark, our good friend and collaborator and the godfather of the σ-hole.